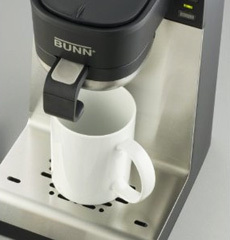 Bunn’s sleek new single-serve coffee maker. Photo courtesy Bunn. The single-cup coffee market (which excludes instant coffee) generated almost $200 million worth of U.S. sales in the last year, according to research firm SymphonyIRI. While that counts for just 5.2% of the coffee category, single-cup coffee sales are growing 28 times as fast as the overall coffee market. Keurig, which is owned by Green Mountain Coffee Roasters, has a reported 71% of the market, according to Bloomberg.com. Convenience and taste are the drivers. Everyone in the household can have a fresh cup whenever they want one. And it’s not just a fresh, hot cup of java,* but whichever origin and style they want at that moment—from decaf French roast to vanilla hazelnut. *Reference to coffee as “java” dates to 1850 and a specific type of coffee, grown on the island of Java and other islands in what is today Indonesia. Bunn, which began manufacturing coffee makers for restaurants in 1957 and moved big-time into the office coffee service market, in more recent years has added a line of home coffee makers. They are stylish while maintaining commercial grade standards. And now, Bunn has the coffee maker: the single-serve coffee maker. In mid-December, we began to test the Bunn My Cafe Home Pod Brewer. Everyone could have the exact kind of coffee he or she wanted; and there was no need to yell “Who wants coffee?” when a fresh pot was made, so as not to let good coffee get baked on the warming plate. The Bunn was received so well that some testers purchased it as holiday gifts. While THE NIBBLE has an assortment of coffeemakers (cone filter, drip, French press and vacuum brewers) that enable us to test different types of coffee, we think a Bunn single-serve coffee maker will be joining them soon. Brush up on your coffee terminology and find recipes in our Gourmet Coffee Section.